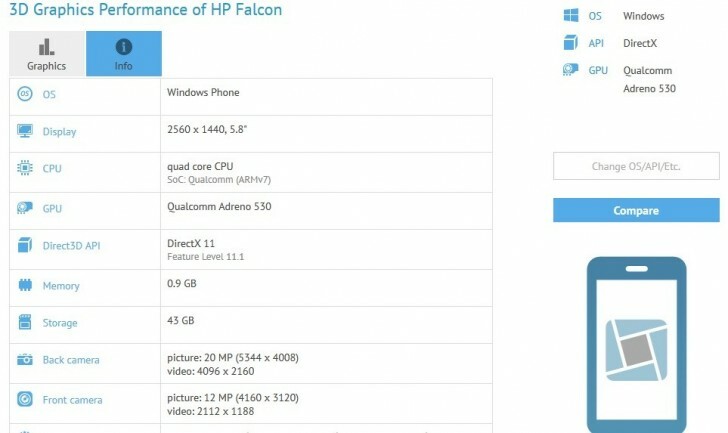 A mysterious new Windows Phone device, dubbed HP Falcon, was spotted listed on benchmarking site GFXBench. The most interesting piece of information the listing reveals is that the handset is powered by Qualcomm's upcoming Snapdragon 820 SoC. The listing also reveals that the smartphone sports a 5.8-inch 2560 x 1440 pixel resolution display, although keep in mind that benchmarks have got screen size wrong quite a few times in the past. The report card also reveals a 20MP rear and a 12MP front camera. The memory configuration (1GB RAM and 43GB storage), however, doesn't seem to be inline with the aforementioned specs, suggesting that at least some of these numbers aren't correct. Coming back to the name, it's a bit difficult to digest that the handset is from HP, as there have been no news whatsoever on that front - not even rumors. It could instead be a Lumia device from Microsoft given that we've already heard some rumors of a smartphone to top the 950XL.